Hooray! A twin encounter at last. 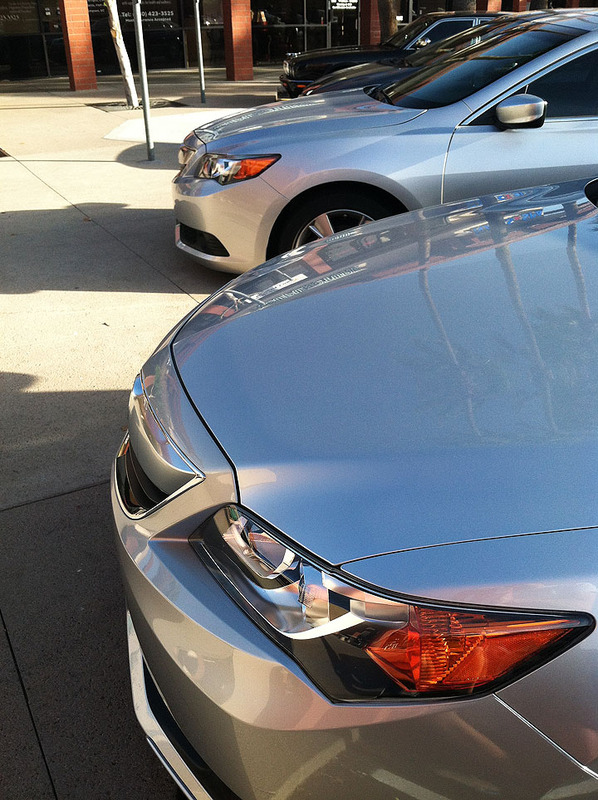 For the first time in the nearly 11 months since I got the key to my new 2013 Acura ILX, I was able to park next to a car that looked exactly like mine (well, minus a few accessories) on Tuesday afternoon. 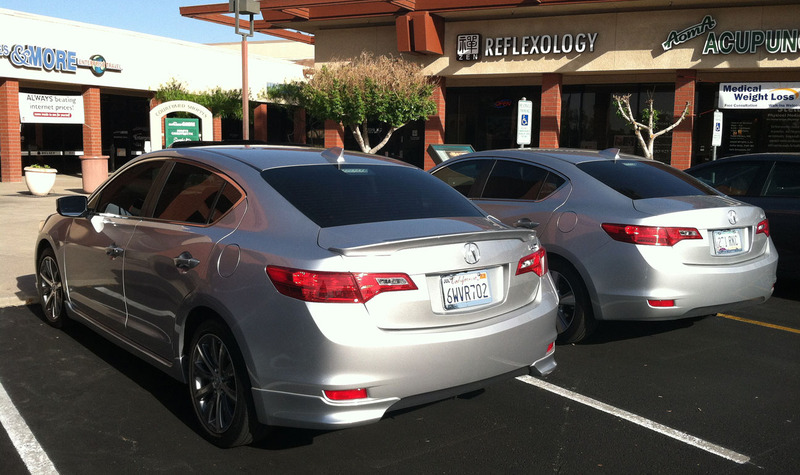 At a strip mall in Scottsdale, Arizona, I pulled up next to this Silver Moon Metallic 2.0 automatic ILX. I stepped inside a business nearby but kept an eye on the parking lot periodically to see who the lucky owner of that ILX might be. Only a few minutes later, I saw a woman come out of a restaurant, take pictures of the two silver cars together, then return to the restaurant! When I finished my errand, I went into that restaurant and attempted to find her. She’d been looking for ME, too! As it turns out, “Bon Bon” has only had her car for about a month. 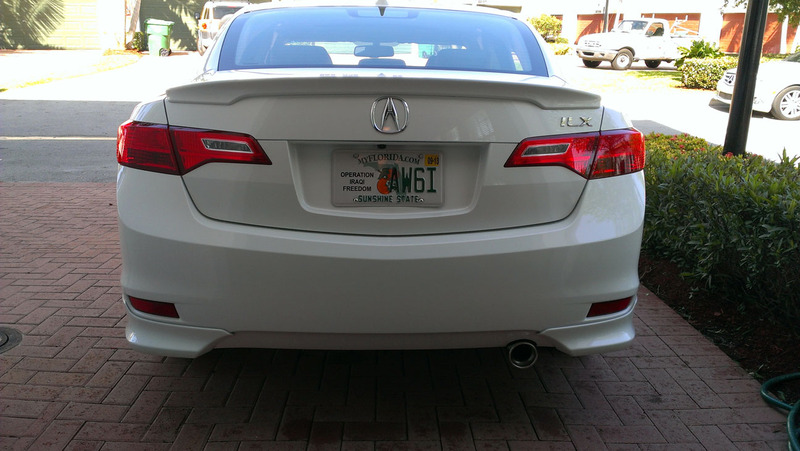 She previously drove an SUV and says that she loves the fuel economy and handling that her ILX provides. She asked about some of the add-ons that my car has. It was great to interact with someone else who is passionate about their new Acura. I gave her a business card and we’ll keep in touch. It’s always a good day when I get to meet up with a fellow car enthusiast who takes a great deal of pride in his or her vehicle. As much as I obsess over Acura and Honda automobiles, I love meeting other people who are just as passionate about other brands — especially those who aren’t afraid to drive their vehicles coast-to-coast! On Monday afternoon, I had the privilege of making a new friend named Armando. He was passing through Scottsdale, Arizona on a monstrous (even by my standards!) cross-country voyage. He’d started in Reading, Pennsylvania and was heading home to Fullerton, California. The drive is 2,700 miles each way — and that’s if it’s driven via the shortest distance route. Armando chose to tack on a few extra miles by venturing as far south as Houston, Texas. Mark, who I’d helped pick up an SVX a couple of months ago in Tucson, introduced us. 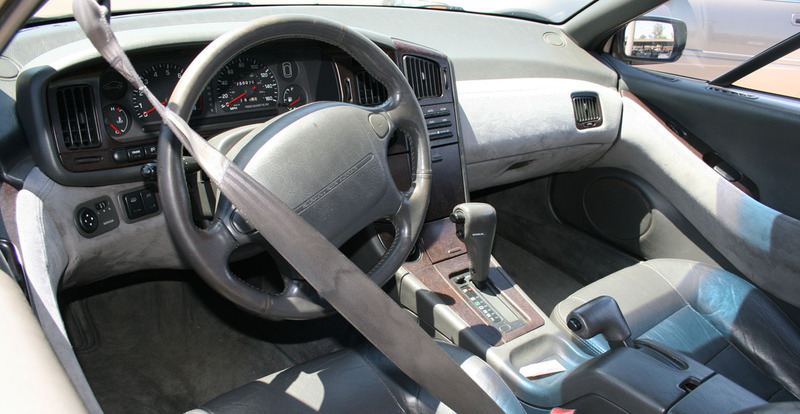 Here’s Armando and his 1992 Subaru SVX in Ebony Pearl exterior with black leather interior. This SVX is one of two SVXs that he owns; the other is pearl white. 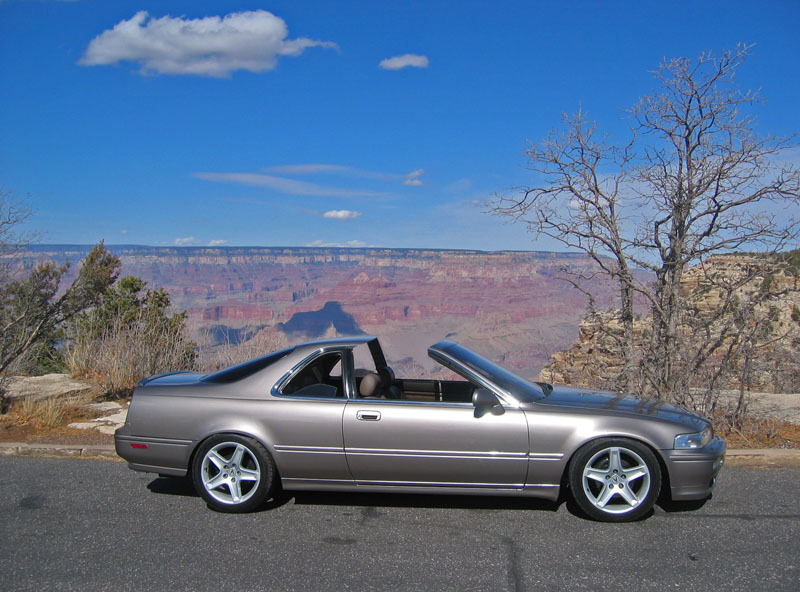 Armando is well known in the Subaru SVX enthusiast community for having attended so many meets in various parts of the country. He sounds like someone else we know! Here’s the interior of the black beauty. Those automatic seatbelts are a pretty rare find. Armando told me that those only made it to certain model years and his happened to be one of them. The best part? 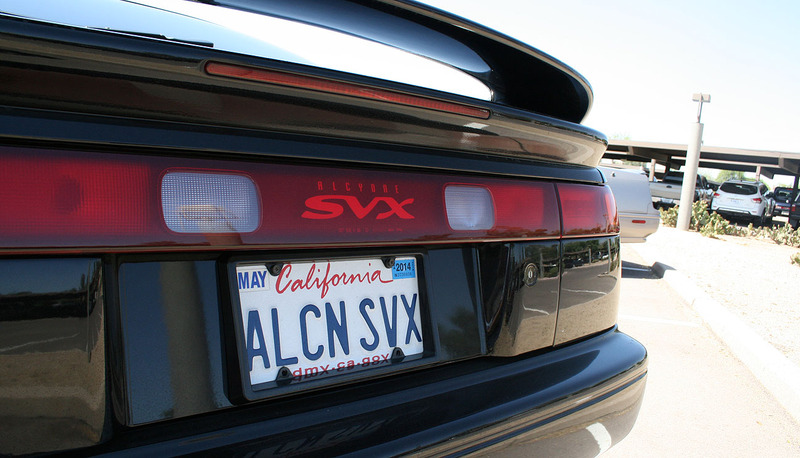 Just 70 miles before our meet-up, Armando’s SVX turned over 1/4 million miles. The Legend + SVX in this picture have a total of over 771,000 miles on them. 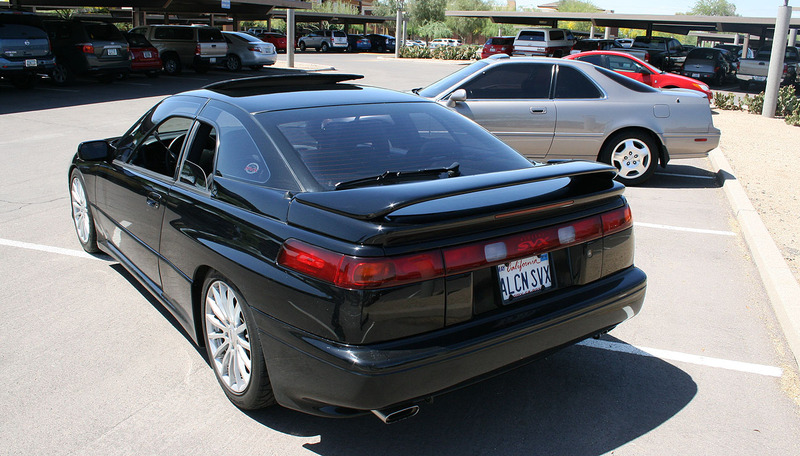 Back view of the SVX and the Legend. Thanks, Armando for meeting up! 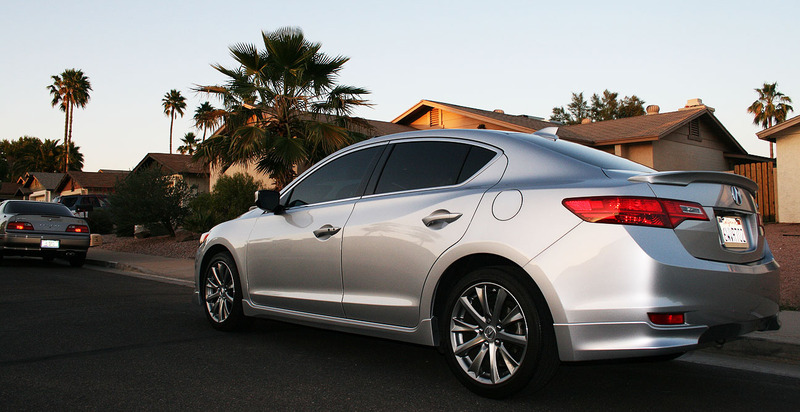 My ILX got a much-needed detail after last weekend’s trip to Utah. 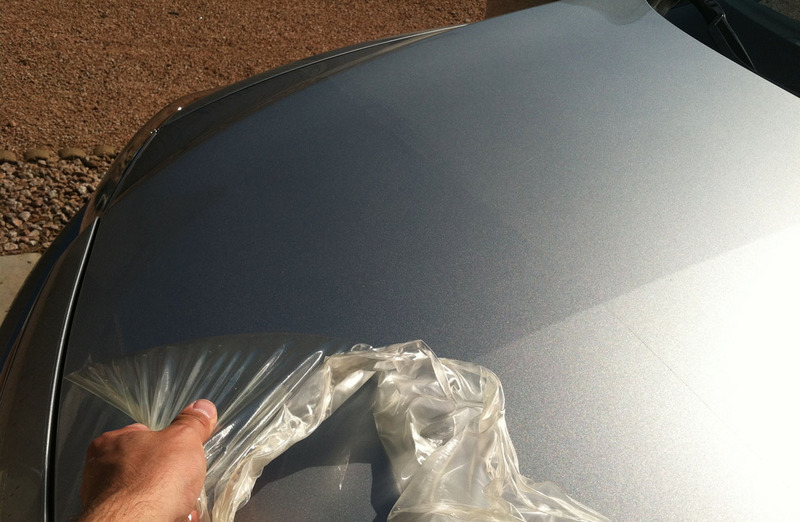 I also decided to strip the 3M clear bra off the hood. I’d noticed that the bra had a very distinct line on the upper edge, plus the hood is angled such that it rarely gets bugs or rock chips anyhow. Thanks to 100+ degree ambient temperatures, this plastic peeled right off. 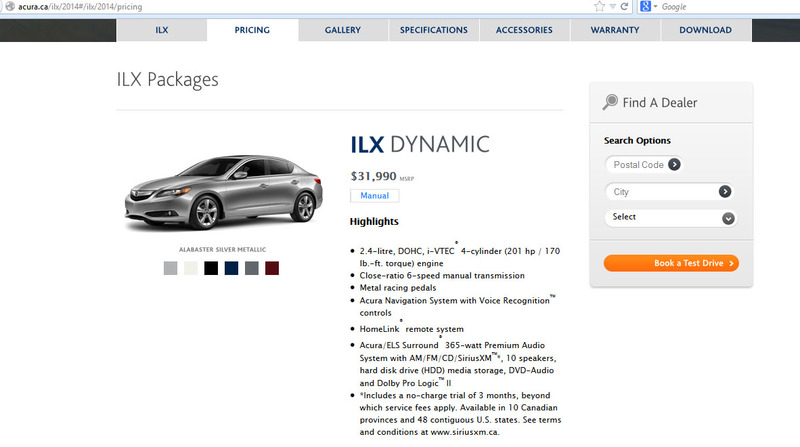 There’s exciting news in Canada: The 2014 ILX is now available for “Build & Price” on Acura Canada’s website, and there are some exciting updates for the car’s second model year. Canadian ILXs may now be equipped with a navigation system as well as the 6-speed drivetrain. These two features had previously been mutually exclusive. It’s fun to see how some ILX owners have begun modifying their vehicles. Here’s one from member “Zonian22” on the Acurazine forums who has installed an exhaust tip on his car (it’s usually hidden behind the rear bumper). I stumbled across some random old Photoshop renderings of my Legend from many years ago that friends have put together. The idea of a “coupe” limousine Legend is cool until you realize there’s no way to get to the back seat except climbing through the front door! In March 2006, my friend Steve took things a little extreme and chopped the roof off for a targa look. Looks like a fun Grand Canyon cruiser. We’re just around the corner from Friday – hope everyone has a great weekend in store! I’ve got a road trip up my sleeve (of course), but you’ll have to tune in next time for more on that. This entry was posted on May 2, 2013 at 6:00 pm and is filed under ILX. You can follow any responses to this entry through the RSS 2.0 feed. You can leave a response, or trackback from your own site. Seeing you mention that you’ve had the ILX for 11 months makes me wonder: did you say you would only have the car for a year? I’m thinking it would make sense for them to now give you an RLX (especially given your Legend history), or at the very least the new MDX, which would be great for these travels of yours. This would be greater advertising than the ads they’re paying for. Hey, that’s a good question. Truly I don’t know the future of where this partnership with Acura will go. When I got the car on June 12, 2012, I was told that at the end of my year of blogging, I’d receive the title to the car. I’ve not yet been approached about any further details. I enjoy driving the ILX but would also be thrilled to be given the opportunity to put another new Acura to a long-term test like this. It’s something I’ll mention to them. Thanks for the kind words and for following along! Carlos, thanks for the encouragement! I’ll keep that in mind! I appreciate the kind words about the blog and I look forward to your comments on each entry. Hope to meet up with you and your TSX at some point in the future. Tyson, great job on getting that bra off. I bet that visible line could end up getting worse over time so, good move there. 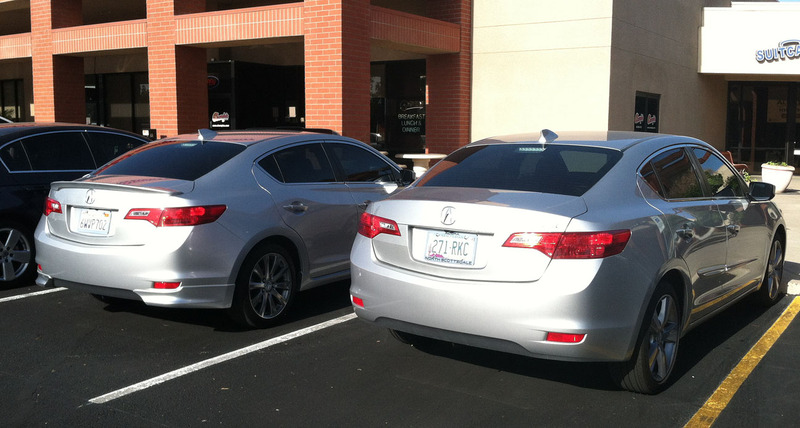 That’s crazy seeing another silver ILX especially that they chose to park next to you. I had a similar experience today. If I had the time, I’d like to make a similar voyage as Armondo and his beautiful SVX. Jason, you’re absolutely right. I’m glad I removed that clear bra for sure. Hey, we’re less than 2 weeks away from our Sedona road trip! Arizona awaits. Hope your Accord’s A/C is working, haha. Talk to you soon my friend. She’s all set and ready. Just counting down the days! I just bought a silver 2013 Acura ILX about a month ago and I came across your car. I really like the mods you did to it. If you don’t mind, can you email me information as to the name and where you got them. My email is floramay.largo@yahoo.com. Example the bumper spoiler, etc. thank you much! Hi there! The accessories you see on my ILX are all from the dealership! Standard parts for the car. Congratulations on joining the family.